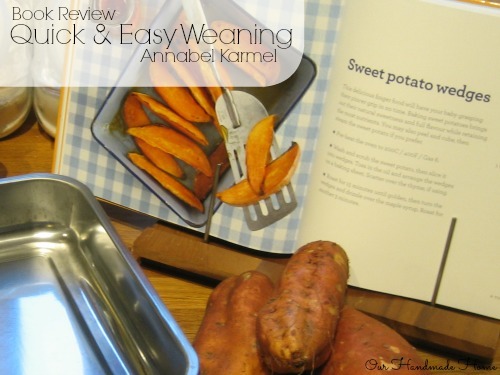 I was sent a copy of Quick and Easy Weaning by Annabel Karmel (Ebury Press, hardback £9.99) for review. I did not receive any payment for the review but I do get to keep the book. All opinions and photos are my own. 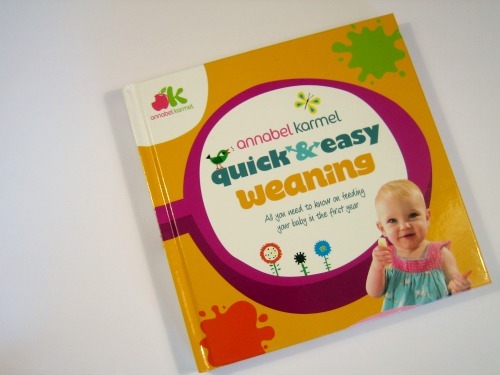 'Quick & Easy Weaning' is a great wee book full of advice and tips about weaning. It is crammed with 100 recipes; from simple veg purées to more exciting mini beefburgers. The recipes I have tried have been easy to follow and, on the whole, have been a hit with everyone in the family. I have really enjoyed the book and would recommend it for anyone with babies or toddlers. 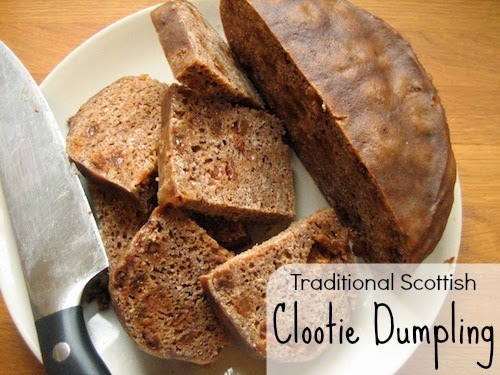 Scroll to the bottom of the page for a quick and easy recipe from the book. Small (now aged 8 1/4) ate practically nothing but apple and sweet potato purée for what seemed like years. When you have a hungry and fussy baby in your arms it can be so tricky to think of new things to try so I was grateful to have this book as a bit of inspiration while I've been weaning Teeny. Teeny is now 11 months old and I try to include him in our family meals, but he can be fussy and we don't always eat appropriate food (like my spicy nine-veg-chilli ) I always have a selection of homemade baby foods in little tubs in the freezer ready to grab. The recipes in 'Quick and Easy Weaning' are a mix of foods to serve to the whole family and great little freezer fillers ready for another day. Tuna and Sweetcorn Fishcakes - Yummy! This made enough for all 4 of us for a light lunch, and were delicious. 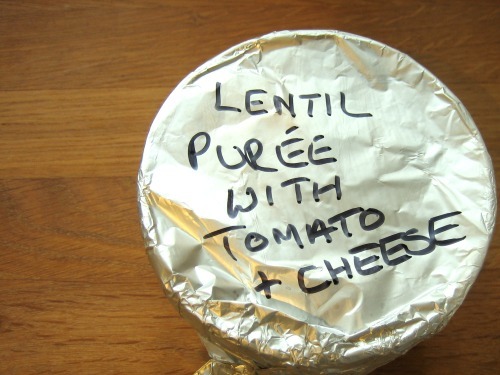 Lentil Purée with Tomato and cheese - This was a winner, as anything with cheese usually is. Organic foods - Babies are teeny tiny, with teeny tiny body parts and they eat an immense amount of food for their body weight. I personally worry about the amount of toxins sprayed onto most food stuffs and try to buy organic for Teeny as much as possible. Baby rice - The University of Surrey did a study into weaning and found a young baby's under-developed gut may struggle to cope with fruit or vegetables and recommends that a baby's first food should be baby rice. This is the guidance I followed and weaned my children on pure organic baby rice for the first weeks of solid food. Age of weaning - Both of my children were weaned around 5 months as they were ready and in need of the sustenance. W.H.O recommends nothing but breast milk for the first 6 months of life, this is the advice given to mothers all around the world and does not take into account the availibility of sterilising equipment, refrigeration or indeed formula feeding - I used my own judgement. But NEVER wean before 17 weeks as the baby's innards just aren't ready and it could cause serious problems. Baby led weaning - I wouldn't have known how to even if I tried. My babies were both spoon fed with purées, which works for us. Here is one of the recipes that the book's publishers have kindly allowed me to reproduce for my readers. 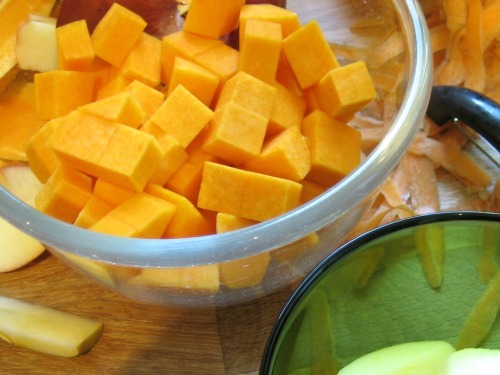 Put the butternut squash and carrot into a saucepan and cover with 150ml boiling water. Add the sweetcorn and continue to cook for 3 minutes until all the vegetables are tender. Blend to a puree using an electric hand blender. * Suitable from 6 months. Labels: baby , Cooking , omnomnomnom , Review , Sponsored post , Sponsored Saturday.